FROCK UP FOR OUR FARMERS! Join us for a night of delicious food, wine, dancing and entertainment in aid of our farmers affected by drought. 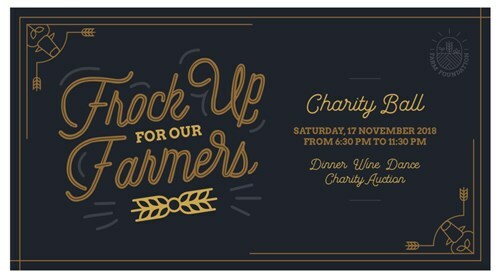 We are holding our FARM (Farms Australia Relief Movement) Charity Ball on the 17th of November, 2018 here in Newcastle, where we invite you to purchase a ticket and 'Frock up for our Farmers' and enjoy a fabulous night out with 100% of our foundations proceeds being donated to the wonderful Drought Angels. Our farmers are suffering with the worst drought to hit our nation in over 100 years. We are aiming to provide much needed relief for the men and women who are the back bone of our country. They shouldn't have to beg for help nor feel the need to ask. We are holding our FARM Charity Ball on the 17th of November, 2018 here in Newcastle, where we invite you to purchase a ticket and 'frock up for our farmers' and enjoy a fabulous night out with 100% of our foundations proceeds are being donated to the wonderful Drought Angels.